Ahok: Victim of a new conservative Indonesia? Basuki Tjahaja Purnama, which is his real name, was convicted for insulting the Quran, by citing a verse at a rally for the citizens of Thousand Islands. September 27, 2016. Especially the FPI (Islamic Defenders Front, a conservative organisation, accused him of blasphemy. @jokowi Dear mr President. How it is possible, a man like Ahok, can be convicted, in one of the largest democracies in the world? Who is Ahok, and why several Islamic groups want him in prison? For that we need to go back to 2005. In this year, Basuki entered politics in his home region Belitung. He was elected with over 37% to become the new regent. In that time, one month after he entered office he manifested himself as a reformer. Move forward, leave the past of violence behind and develop a region of prosperity, without corruption, less bureaucracy, less traffic congestion and more job opportunities. He became quite successful, and he became popular by many. In 2007 he resigned, and run for governor for Bangka- Belitung. The former president Abdurrahman Wahid convinced him to run for public office, and admired him for the healthcare reforms. Basuki was defeated by Eko Maulana Ali, supported by the FPI, as they never accept a Governor, from a minority population. In 2009, Ahok became a member of the House of Representatives, for the Golkar party. In 2011, he made himself impopular to criticize the tin mining industry, for causing great environmental damage. Youth NGO’s, supported by the FPI reported him the House of Ethics. In that same year, he became the running mate of the current president of Indonesia, Jomo Widodo. In the second election round, they defeated governor Fauzi Bowo. Foke, as he is called by many, received a reprimand from his own Democratic Party, for joining a FPI event in 2010. He, and the Metro Jaya Police Chief Inspector General Pradopo East Pol, ate rice together with senior leaders of Habib Rizieq’s organization, at the FPI headquarters. In 2014 when Joko Widodo took a temporary leave from his post as Jakarta governor to run for President, Basuki became the acting Governor of Jakarta from 1 June 2014. In November, that same year, Widodo became the 7th president of Indonesia, and Basuki was sworn in as the new governor of Jakarta. Since then, Basuki is a regular target by ultra- conservatives and rival candidates for being a non-muslim. Especially his minority background, made him a victim of the FPI. Several rallies were organised in the weeks of the inauguration of Basuki. In 2016, Habib Rizieq, leader of the FPI says: “If Jesus is the son of God, who is the midwife?” Which is, in fact blasphemy, but no one cared. In 2017, 15 February, Basuki reached to the second round run-off between two candidates,Anies Baswedan and Agus Yudhoyono. As you might have guessed: Anies Baswedan, speeched in front of a rally, organised by the FPI. As well Agus Yudhoyon, was supported by his father, the former President Susilo Bambang Yudhoyon who is,according to the media, behind the rally against Basuki, which started the accusations of blasphemy. Strangely, on the day Basuki speeches, no one protested. A week later a video appeared, and protests begun. According to the national and international press, the video was manipulated. It 2017, it seems the FPI finally succeeded to defeat Basuki…. In a new sign of a regression in press freedom in Egypt, authorities have ordered three journalists working for the Al Jazeera English (AJE) channel held in custody for fifteen days. Cameras and other broadcasting equipment were seized during the raid on the work room where the AJE TV crew had reportedly conducted interviews with activists and Muslim Brotherhood members on the political crisis in Egypt. A fourth member of the AJE team–Cameraman Mohamed Fawzy–was also arrested but was released hours later without charge. The latest detentions raise the number of journalists affiliated with Al Jazeera and who are now jailed in Cairo , to five. Al Jazeera Arabic correspondent Abdullah Al Shami was arrested on 14 August while covering the brutal security crackdown on supporters of toppled President Mohamed Morsi at Rab’aa–the larger of two encampments where pro-Morsi protesters had been demonstrating against his forced removal and demanding his reinstatement. Al Jazeera Mubasher Misr Cameraman Mohamed Badr was meanwhile, arrested on 15 July while covering clashes between security forces and pro-Morsi protesters in Ramses Square. 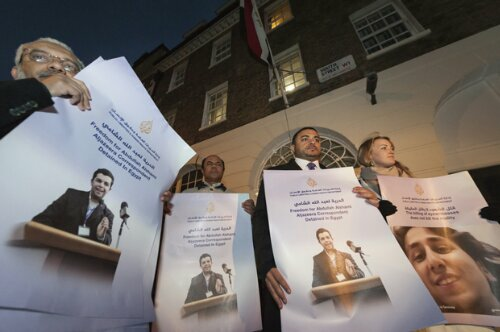 Al Jazeera has denounced the arrests of its staff members as an act designed to “stifle and repress the freedom of reporting by the network’s journalists.” The Egyptian government’s hostility towards journalists affiliated with the Qatari-based network has been prompted by what many Egyptians perceive as “a pro-Muslim Brotherhood bias in the network’s coverage of the events unfolding in Egypt”. Since the military takeover of the country in July 2013, at least 22 staff members have resigned from AJ Jazeera Mubasher Misr, the Egyptian arm of the network , over the alleged “bias in favour of the Islamist group”. Al Jazeera has however, denied the allegation. The latest detentions are perceived by analysts as part of the crackdown on the Muslim Brotherhood–the Islamist group from which the deposed President hails. Last week, the group was officially classified as a “terrorist organization” by the Egyptian authorities, in a move criminalizing the group’s activities, financing and membership . The arrests of the AJE journalists have also raised fears among rights activists and organizations that the government crackdown was “widening to silence all voices of dissent”. Human Rights Lawyer Ragia Omran told the New York Times on Monday the charges are “part of a pattern of aggressive prosecutions–including conviction of protesters— that were rarely pursued even under Hosni Mubarak.” The New York-based Committee For the Protection of Journalists , CPJ, has also condemned the arrests, calling on the Egyptian government to release the journalists immediately . In a statement released by CPJ, Sherif Mansour, Middle East and North Africa coordinator , said “ the Egyptian government was equating legitimate journalistic work with acts of terrorism in an effort to censor critical news coverage.” In its annual census conducted last month, the CPJ ranked Egypt among the top ten jailers of journalists in the world with at least five journalists languishing in Egyptian prisons. It has also listed Egypt among the three most dangerous countries for journalists in the Middle East after Syria and Iraq . Six journalists have been killed in the country over the course of the past year, three of them while covering the bloody crackdown on Morsi’s supporters at Rab’aa. Members of Mohamed Fahmy’s family meanwhile used his Twitter account to send a message on Tuesday reminding the government that “journalists are not terrorists.” His supporters meanwhile started a hashtag on Twitter calling for his release. Many of them expressed disappointment at what they described as “the government’s latest act of repression” warning that it would harm the government’s image much more than any amount of critical reporting would. 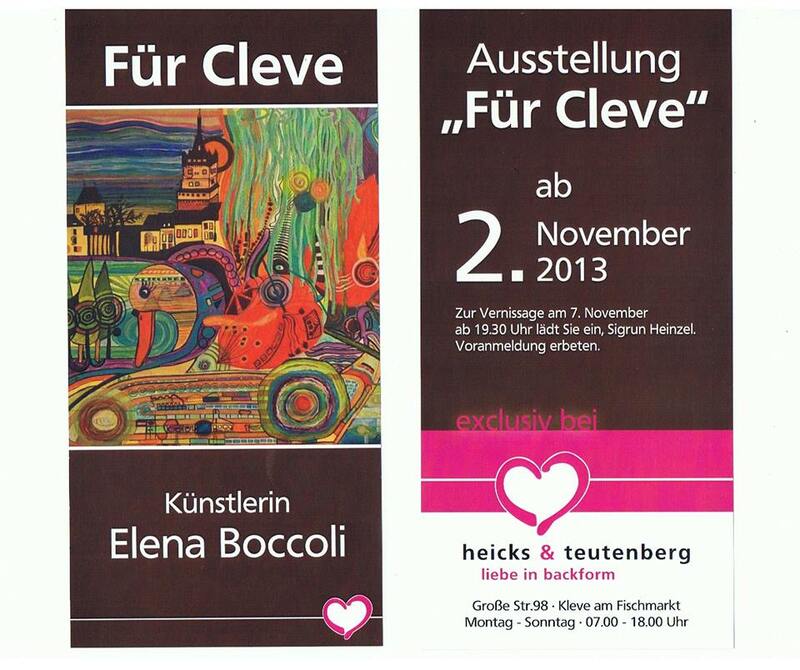 The exposition Für Cleves began on Thursday November 7, 2013 . Over 80 invited guests were present at Heicks und Teutenberg at the Fischmarkt in Cleves, Germany. The artist Elena Boccoli is showing 13 of her works to the public. 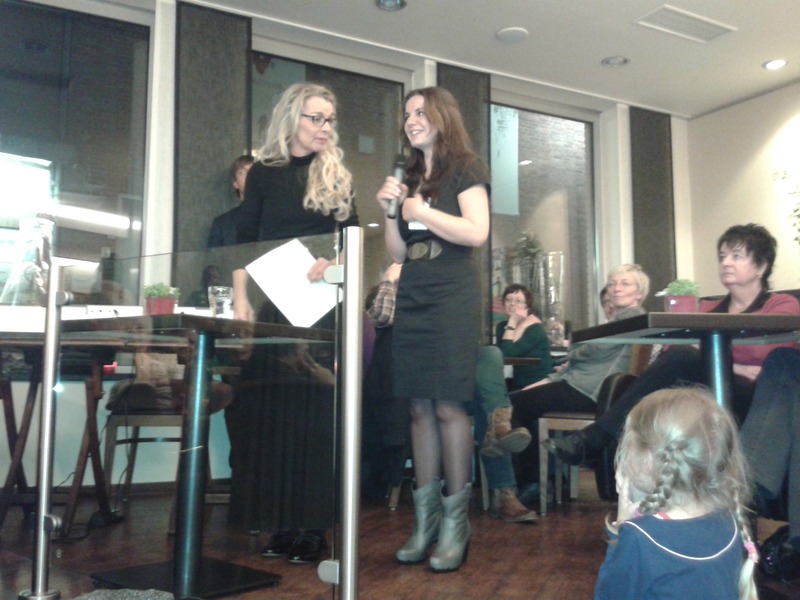 The hostess, Sigrun Heinzel praised Elena for her great work. A wide range of different style paintings are to see until January 15, 2014. Elena Boccoli, born in Maasbracht, The Netherlands, daughter of an Italian father and a Dutch mother. She is raised in Italy. First in Posada Sardinia and at the age of 22 she went to Piemonte. In 2000 she came back to the North and moved to Kranenburg Germany. In 2004 she moved to Cleves. Here she lives since then and it was in this little town she developed her artistic activities. Hundertwasser, an Austrian painter inspired Elena Boccoli. It all started by copying a few of his works. Great patterns of colours and many characters and figures is typical for his works and this appears in the paintings of Elena as well. She developed her own style and took a distance from her inspirer. From abstract to surrealistic images in acrylic or oil paint. Many Cleves Sights and attractions are eternalized by her on canvas. Cleves (German: Kleve) is a small town, about 30 kilometres from the Dutch city Nijmegen. Through time, Cleves is closely connected with The Netherlands. The duke Johan Maurits came back from Brasil to Europe and accepted the post of governor of Cleves in the 17th century. He gave this town wealth through a huge city park and attracted many dutch nobles and other important people to the city centre. In the 19th century the famous landscape painter Barend Cornelis Koekkoek came over from the Netherlands and established, downtown, his school of painting. In 1843 he constructed Belvedere and two years later his city palace. These are only a few examples of many famous people who came to Cleve. When you enter the town via the Tiergartenstrasse, you will see on your left the Forstgarten, which is the second most impressive city parc of Germany. On the right side Kurhaus, a spa house from the 18th century which is a museum now. Further up many villas appear on both sides of the road. Most of the houses designed by Dutch architects for the rich from the Netherlands. Until the 19th century, most of the Cleveners lived in the upper town. Elena Boccoli painted several architectural highlights. The Schwanenburg, Stiftskirche, Haus Koekkoek or the Schutzenhaus. Unfortunately this last building doesn’t exist anymore. 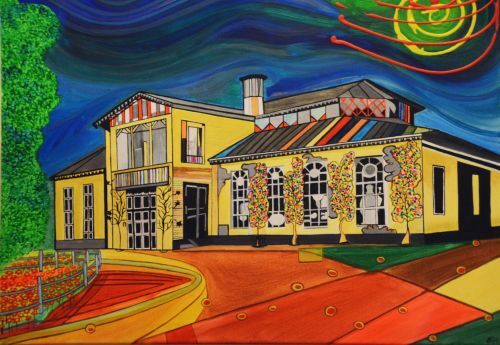 Elena Boccoli brings back the house on canvas in a colorful pallet. Or paintings like the Elsabrunne from Karl-Henning Seemann, the Schüsterken from Jupp Brüx are all an ode to Cleves. The paintings about Cleves are a real eye catcher as soon as you enter Heicks und Teutenberg. But as she has a wide orientation, the visitor is surprised by the pop-art stylish paintings in the back of the room. Definitely worth to pay attention to these paintings as well. 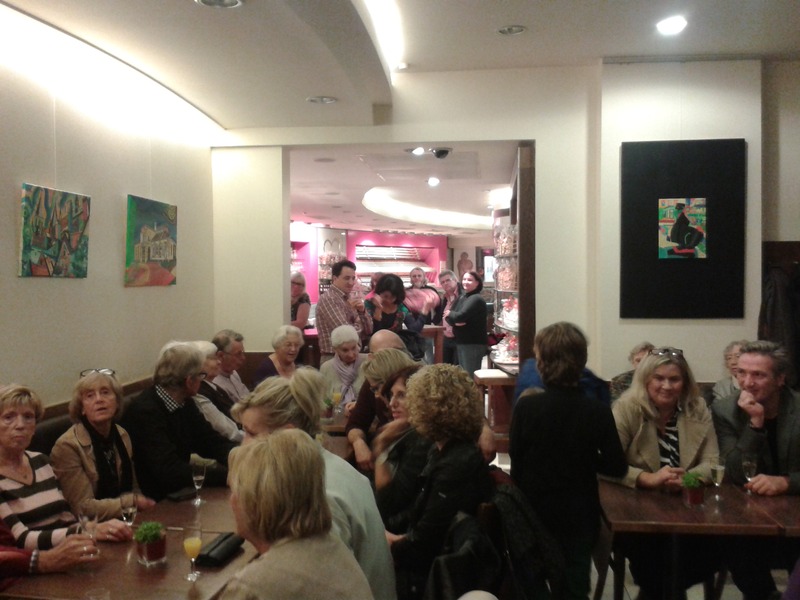 The Vernissage started at 7:30 pm. Half an hour before, several guests were standing in the doorway already. Shortly before the official opening the crowd entered the room at Heicks und Teutenberg. Young and old people. Business people, artists, families,pensioners etc. The hostess Sigrun Heinzel started the exposition by a speech. The guests were informed by a short impression of the artist Elena Boccoli. The second speaker was the artist herself. She thanked all the guest who came tonight in large numbers. Mannfred Hendricks composed piano music to lead the people from the first to the last painting. The catering was well taken care of by Heicks und Teutenberg. For everyone was enough food and drinks. At 10 pm, unfortunately the evening came to an end. Everybody spoke out their compliments for the wonderful evening and a few potential buyers informed about the possibility to own one of Elena’s paintings. The last day of the exposition is the 15th of January 2014 and can be viewed 7 days a week from 7:00 am till 6:00 pm. 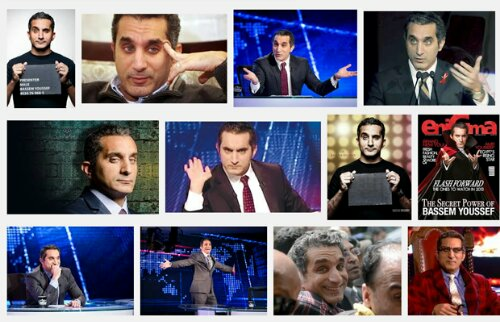 Anger at the new series of “Egyptian Jon Stewart’s” TV show reflects the country’s deepening divisions. Shahira Amin reports. A campaign titled ‘Tamarod’ (the Arabic word for rebellion), calling for the fall of President Mohamed Morsi, is quickly gaining momentum in Egypt. The brainchild of the country’s ‘Kefaya’ (which means enough in Arabic) movement — the petition calling for Morsi’s ouster has had more than 7.5 million signatures to date. The campaign’s organisers say they hope to gather 15 million signatures by 30 June, the first anniversary of Morsi’s inauguration. They have also called for a mass protest in front of the Ittihadeya Presidential Palace the same day, in efforts to pressure Morsi into stepping down from the presidency and call for early presidential elections. Scores of youth volunteers have been standing on busy street corners in Cairo’s affluent Zamalek and Mohandesseen neighbourhoods, urging commuters to sign the petition highlighting Morsi’s failure to deliver on his campaign promises of improving the economy, narrowing the country’s economic divide, and restoring security on the streets. Curious drivers and pedestrians stop to read the leaflets, bringing traffic to a standstill as supporters of the campaign chant anti-government slogans, and flash victory signs. “The response to the campaign has been overwhelming . Egyptians are growing increasingly frustrated with the faltering economy , soaring prices of basic commodities, the fragile security situation and persistent power cuts, ” said Naglaa Bakr, a Mohandesseen resident and housewife, who had just signed the petition. “Morsi has to go”, she added. The popular movement has now begun to draw support different factions in Egypt’s fractured opposition. As the campaign picks up steam, members of the Egyptian Federation of Trade Unions, the Dostour (Arabic for constitution) Party, the Social Democratic Party, the Free Egyptians, the 6 April youth movement, and the Journalists’ Syndicate have lent their support. In response to Tamarod, Morsi’s Islamist supporters have launched their own campaign called ‘Tagarod’ — the Arabic word for impartiality. Tagarod’s leaders say that theirs is “an initiative to support legitimacy”, accusing Tamarod of aiming to destabilise the country and spread chaos. Tagarod’s founder, Assem Abdel Maged, is confident that his campaign would garner more signatures than those of Tamarod. Abdel Maged, who is also a member of the Jama’a Islamiya group, aims to use his own petition to prove that there are more Egyptians rallying behind the Islamist President than his opponents. The Tagarod campaign has also vowed to organise a million-man march to show solidarity with Morsi. “The campaigns accentuate the secular-Islamist divide in the deeply polarised country. Tensions are building up ahead of protests planned for 30 June”, said Hadia Abdul Fattah, a Tamarod campaign member, who has been gathering signatures in the northeastern city of Damietta. In recent weeks, several members of the Tamarod campaign have faced detention for distributing the petition on or near university campuses in Cairo, Sohag, and Zagazig. The targeted campaigners were forced to sign documents stating that they would no longer distribute Tamarod petitions, or take part in political activities on campus. In March, the Supreme Council of Universities banned political activities on campuses, under the pretence of ending violence between different political groups. Some have warned that a crackdown on the movement could spark the kind of civil unrest that Morsi has been trying to avoid. Opposition activists say they will no longer tolerate any kind of repression, and vow to continue to protest until their demands are met. Even if the campaign fails to reach its 15 million signature goal, activist and human rights lawyer Tarek Moawad told Index that the initiative highlights the crisis of legitimacy facing Morsi, and sends a clear message that Egyptians will not be silent about injustice. Morsi’s usage of Mubarak-era tactics to silence critics — whether it’s targeting journalists or the green light given to Islamist supporters attacking opposition activists — is a sign of the government’s weakness and vulnerability, he added. Some analysts have also suggested that Egypt’s liberal opposition could use Tamarod to their advantage, by galvanising support for the liberal opposition in the upcoming parliamentary elections in October. “If the political opposition can close ranks and adopt a unified stance, Tamarod may have the potential to boost gains for the secularist opposition which has so far failed to organise,” said Dr. Mostafa Kamel El Sayed, Professor of Political Science at Cairo University. Caught in the web: how free are we online? 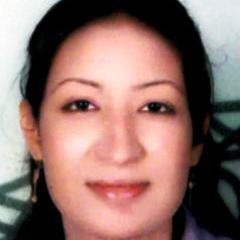 Dimyana Abdel Nour, a 24 year-old social studies teacher at Naga El Sheikh Sultan primary school in the small village of Tud near Luxor faces trial for insulting Islam, and risks a harsh prison sentence. Her case is the latest in a growing number of blasphemy cases against Egypt’s Coptic Christian community under the rule of the Muslim Brotherhood. Abdel Nour was imprisoned for a week before being released on bail of nearly $3,000. She has now gone into hiding. Three of the teacher’s students in filed a criminal complaint against her with the Public Prosecutor’s Office last month, claiming she had said that the late Pope Shenouda, former Head of Egypt’s Coptic Orthodox Church was better than Islam’s Prophet Mohammed. Mostafa Mekki, the school principal, has defended Abdel Nour, saying her other students had said the accusation was false. “The parents of the three students who filed the complaint are extremists and have on several occasions incited hatred and violence towards Christians,” Mekki told Index On Censorship. Mekki has been forced to cancel Abdel Nour’s temporary contract with the school in a bid to ease tensions but insists she has done nothing wrong. He has since been removed from his post as principal and was transferred to an administrative job for siding with Abdel Nour in the case. Local Christians say Mekki had received threats because of his stance. Archbishop Sarabamon El Shayeb, Head of the All Saints Monastery in Tud described Abdel Nour’s prosecution as part of “organised repression of Egypt’s Copts”. “The Islamists are giving out the accusations of blasphemy generously and openly, mostly against Christians,” he told Christian Science Monitor last week. While Abdel Nour is in hiding and was absent from the trial, her lawyers and rights activists who attended the trial described the case as “unjust” saying that only the three students who had filed the complaint had been summoned as witnesses and not the other students who had denied the accusations. Abdel Nour’s lawyers also cited concerns that the rise of Islamists to power had “fueled the injustice against Coptic Christians” amid simmering sectarian tensions in the last two years. Last year, a Coptic teacher in the upper Egyptian city of Sohag was sentenced to six years in prison for insulting Islam and the president. In September 2012, Egyptian blogger Alber Saber was also arrested and detained on allegations of having shared the YouTube trailer for the anti-Islam film “Innocence of Muslims” on a Facebook page he administers. Saber, a computer science student from a Christian family was sentenced to three years in a Cairo prison. He appealed the case and was released after paying $167 bail. His mother said that Saber has fled the country to avert being convicted a second time. Saber’s mother was forced to leave the family home and has been in hiding since after suffering harassment at the hands of Muslim extremists in her neighborhood who said her son deserved to be killed for being a self-declared atheist. What is our true hunger ?